On August 30th at 11:00pm Hawaiian time, the Kosmos 1315 satellite reentered the Earth’s atmosphere over the islands of Hawaii. The satellite’s reentry reflects the historic race to space between the Soviet Union and the United States during the Cold War. On October 13th, 1981, the USSR launched Kosmos 1315 as an electronic signal intelligence satellite. Kosmos 1315 originates from a pool of hundreds of satellites under the name of Kosmos launched by the USSR. 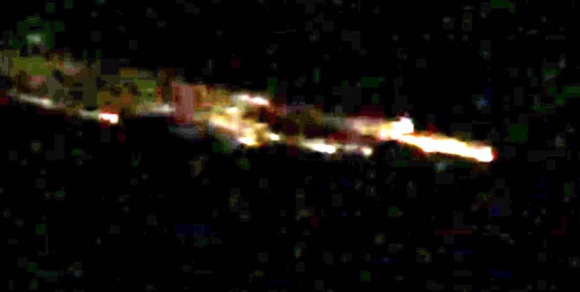 A satellite’s reentry is very different from that of a meteor. Its reentry velocity is much slower and doesn’t display the classic “tail” trailing behind it; a characteristic common of comets and meteors. Instead, individual chunks of debris follow behind the satellite, as seen in the photo above. Many confuse satellites for UFOs or other types of phenomenon. The next time your Facebook or Twitter feeds explode with news of a UFO sighting, take a moment to consider all the possibilities. But hey, when the possible prove false, only what seems impossible remains as the logical conclusion. Astronomy, Hawaii, history, Kosmos 1315, meteor, satellite. Bookmark.